Miramar, one of the most-watched U.S. miltary microgrid projects, is getting ready to demonstrate that today’s microgrids are about a whole lot more than just back-up power. 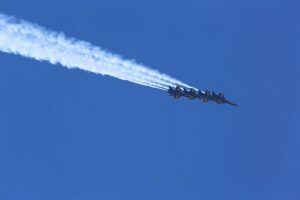 That was the word from Mick Wasco, installation energy manager at the Marine Corps Air Station (MCAS) Miramar in San Diego, in an interview this week, following announcement that the Department of Defense had selected Black & Veatch and Schneider Electric to develop the microgrid. With $20 million in Congressional funding, the San Diego naval base is building one of the largest military microgid projects. As such, Miramar is a frequent topic at industry gatherings, especially since release of its solicitation for a microgrid developer about two years ago. No military microgrid has received more money from Congress to date. And Wasco would like to see that money put to use not only enhancing military energy security, but also showing what an advanced microgrid offers the larger central grid. Such work is in keeping with a growing trend within the industry to demonstrate the complex value that advanced microgrids bring to North America’s grid. Early projects focused on reliability; newer iterations continue to do so. But they also are focusing on how microgrid software can puzzle out complex relationships to achieve best economics for microgrid customers and also help the central grid by providing a host of services, including firming renewable energy. Miramar, which expects to have the advanced microgrid operating by July 2018, is building upon distributed energy assets already on the base, including 1.6 MW of solar PV and 3.2 MW generated from landfill methane gas. It also already has a small microgrid within the microgrid that uses a synchronized flow battery and PV to island a building. Schneider and Black & Veatch will add two diesel and two natural gas generators, totaling 7 MW. The generators will be used in several ways: for backup power, to provide support services to the central grid, and help the installation reduce its utility demand charges, manage load and participate in demand response programs. The generation also will be used to firm renewable energy. “For us that’s a huge economic opportunity,” said Wasco, who said that spikes in demand created by the intermittency of the landfill gas costs the installation up to $300,000 per year in demand charges. The team of Schneider and Black & Veatch were selected as developers from a solicitation issued by the Department of Defense in 2014. Miramar ZnBr Flow Battery Simulated MicroGrid, in the Energy Storage Lab (ESL) at the Energy Systems Integration Facility (ESIF). 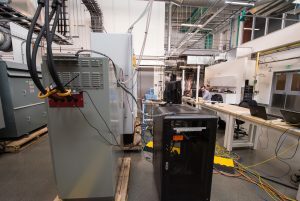 (Photo by Dennis Schroeder / NREL)..
Mark Feasel, Schneider Electric’s vice president for utility segment and smart grid, said that the Miramar project also models how to incorporate utility-scale components within a microgrid connected at the 12-kV level. Rather than using components and software common to campus-style microgrids, the project is taking advantage of the high-end functionality of utility-scale equipment. “We’re able to bring in those utility class solutions and scale them down, which is often a difficult thing to do; they tend to be large and expensive,” Feasel said. Phil Barton, director of the Microgrid Competency Center at Schneider Electric, said that the project also highlights “the continued demonstration that with microgrids it really takes a village.” Schneider’s ability and willingness to partner with others – in this case Black & Veatch — likely helped win the bid, he said. Schneider follows the business partnership model in developing microgrids. Another example is its work on the Texas Oncor microgrid with S&C Electric. 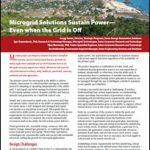 Track development of military microgrid projects by subscribing to the free Microgrid Knowledge newsletter. Calculating Microgrid Return on Investment (ROI): What’s Electric Reliability Worth? Is it possible to apply for the ESS of wind farm? One of my customer try to invest ESS (10MW) for 30MW WIND FARM in JEJU island soon.